As most parents of preschoolers know, young children have a “what is yours is also mine” perspective on life. My son, who recently turned five, often asks to share my drinks, food, personal space, etc. He also loves to play Angry Birds on my phone if he gets the opportunity. My son is very active and loves to play, but in his downtime (often while I am doing my doctoral work), he enjoys watching a few shows on Netflix. His chosen programs have varied over the past few years, but he has recently taken a great liking to Pokémon: Indigo League and Pokémon: XY. I was a bit too old to get into Pokémon in the late 90s, but I remember my brother watching it and playing Red and Blue on his Gameboy. When Pokémon Go came out this summer, it was a pop culture sensation (if you haven’t heard of it, more power to you!) It also made my spidey sense tingle given the potential cravings of my son and high data usage, so I was very hesitant to try it out. On July 27, I made the decision to finally give it a whirl while visiting the Perot Science Museum in Dallas (highly recommended!) A few of my work colleagues were experimenting with the app at the time and one had mentioned the plethora of Pokéstops and different Pokémon types at the museum, so I made the choice that has changed my life in so many ways. Just kidding. I did, however, decide to test it out for five days to see what the hype was about and if there was any reasonable application to my teaching practice or research. While walking through the museum, I created an account, made a particularly handsome avatar (obviously), and set off on my adventure. 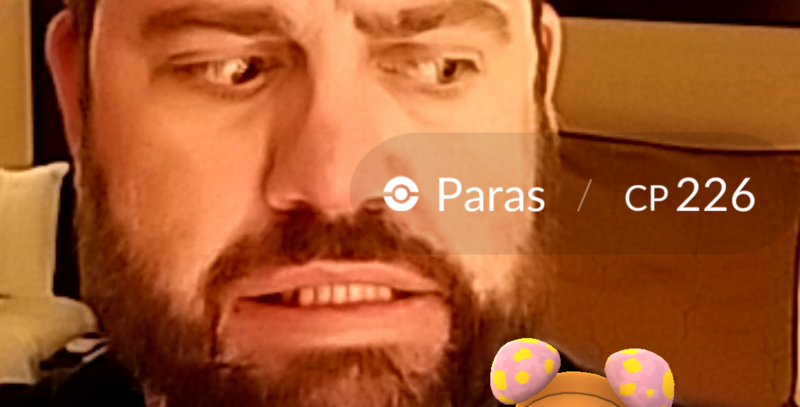 My colleague was correct – there were a number Pokéstops in close proximity that refreshed every five minutes and gave access to the precious Pokéball commodity. I also caught my first few Pokémon without much difficulty. As I walked through the exhibits with my fiancée and son, something became very apparent: I was paying far more attention to the game than I was the people that I loved or the museum itself. 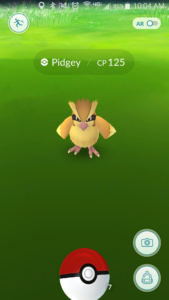 *check* To round out Day 1, I tried out the application once I got home to see if there were any Pokémon around my home and found a Pidgey in my living room. Over the next four days, I experimented with the application in a number of places such as parks and my university. My undertakings led to a number of frustrations with simultaneous exhilaration. For example, one of the app’s main goals is to have the user walk while the GPS tracks movement. Pokémon Go rewards those who walk by allowing them to hatch eggs that provide a random creature and experience points (XP) that help you level up your character. Like any role-playing game, leveling up provides new abilities, items, and creatures and it is much easier to advance up the progress tree early in the game. However, I quickly found out that the location settings are imprecise at best and that I often walked significantly further than I received credit for in the game. This was verified afterward by checking my phone-based fitness app and my Fitbit Surge. I quite regularly would only get around two kilometers when I had walked three miles. Another really interesting feature in the game is augmented reality. Pokémon Go achieves this through the GPS tracking and the phone’s camera. 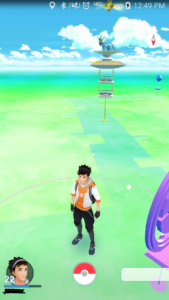 While going for a walk, someone can come across a Magikarp while looking at a pond, which provides a fun experience that is typically not available in mobile games. It is always fun to orient a camera to make a Paras stand on your spouse’s head, right? Like the location tracking, this feature is also problematic as it is incredibly resource intensive. 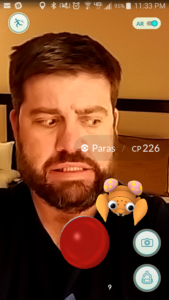 Using augmented reality wore down my battery significantly faster than with the standard view and often led to performance issues, most notably skipping resulting in poor throws while trying to catch Pokémon. The standard view does improve performance and battery life, but the screen must always be on to be able to accrue kilometers walked and come across wild Pokémon. When I started playing the game, I told myself that I would play for five days and put it away for good. My son was not aware that I had played and it would have been easy to stop for good – but I did not. After taking off a few days off, I decided to check out the app while I was visiting my best friend in Austin. We went for a number of walks and visited some different locations. I caught a number of new Pokémon, including my son’s favorite at the time: Scyther. When I decided to share the news with him, I quickly found out that he had already played the game at his mom’s house and he has not since asked to play with any regularity. Crisis averted and I learned that I need to give my son more credit! Since that trip, I have played the game off and on, and am now up to level 22 with a number of high-powered Pokémon that can battle with those placed in opposing gyms on campus. These gyms can be fun from time to time, but I find them to be much less valuable than “traveling across the land, searching far and wide” to catch Pokémon. + It gets me walking more than I normally would. I have had a goal of hitting 10,000 steps a day and this app has helped encourage me by shaking up my routine. I plan walks throughout my day that take me by Pokéstops and areas on campus where it is easier to find Pokémon. + It has continued to remain entertaining after two full months of use. + It has been fun to share my new Pokémon with my friends and my son (who only asks to catch one here and there, and is more excited about what I catch at that time). – It has distracted me and there is temptation to use it at poor times. I can easily see why people have walked into traffic (the worst I have done is trip on a step). Worse yet, I could see why Niantic added the passenger verification gateway to help deter people from using it while driving. While it is simple to quickly click through, it can at least serve as a quick intervention (while undoubtedly decreasing Niantic’s liability). I could also see how having a nearby Pokéstop could increase distractions at work and school (see signs warning about it). – It has also diverted attention from loved ones and decreased using our imagination. For example, my son and I used to take Pokéwalks before they were cool. We would go to a park near my house, which had a playground and a concrete loop for exercise, and find Pokémon in various places. Diglets and Cubones were in the dirt, Beedrills and Pidgeottos were in the trees, Bulbasaurs and Caterpees were in the grass, and Geodudes and Onyxs were in the rock wall. Once we both found out about Pokémon go, the focus turned more to finding what was in the game and it became less fun overall. – Additionally, I have found myself distracted by the game while taking walks with my fiancée and have since made it a point to mainly play it when I exercise by myself. Even doing this, I am still not unplugging myself from the digital world by enjoying the beauty of the outdoors and refraining from staring at a screen (which I do most of the day). 1) The application has a map overlay that includes roads, paths, bodies of water, and buildings. Users can also zoom in and out on the map. This could be useful for spatial understanding, such as scale, perspective, distance, city layouts, and how environmental features can shape development. 2) Pokémon has some complex names for the different creatures which could possibly help with language development such as word articulation and association. 3) There is a finite number of items such as Pokéballs, which requires careful management. This could be useful in teaching notions of budgeting, patience, and planning. 4) Given that the Pokéstops are typically cultural landmarks, this may help students learn more about their community.